As the longest-running national celebration of books for young people and the joy of reading, over 650 schools, libraries, and bookstores will host official Children’s Book Week events between May 1-7 from coast to coast in all 50 states. Voting for the 10th Annual Children’s & Teen Choice Book Awards, the only book award voted on solely by kids & teens, has been in progress since March 3, and many locations will hold group voting in the class, store, or library from May 1-7, when voting ends. to promote a wonderful week of reading! To register go to nevinslibrary.org and check out our Calendar of Events. Children’s Book Week is a cornerstone program of Every Child a Reader, a 501(c)(3) literacy charity dedicated to inspiring a lifelong love of reading in children and teens across America. Other national programs include the Children’s and Teen Choice Book Awards, Reading Without Walls, and the National Ambassador for Young People’s Literature, in partnership with the Library of Congress. Individual and corporate donations, grants, and the Children’s Book Council support Every Child a Reader. Go to nevinslibrary.org for more information about children’s programs and to register for the event. Categories: Books, Celebrations, Childrens, Programs | Tags: Childrens Book Week, Choice book awards, Every Child a Reader, One World Many Stories, reading | Permalink. Everyone loves bacon. But he loves himself most of all. He loves how good he smells and how much everyone likes him. The other breakfast foods cheer him on in his self-love. He starts to get a big head from all of the attention he is getting though. The merchandise with his face on it, the adoring fans, the fancy cars–these all aid the growth of his narcissism. The other breakfast meats become upset that he is stealing their thunder and his old friends begin to realize how self-absorbed he has become. In the end, we find out that everyone loves bacon sooo much… that he is eaten. This picture book is an easy read and it is hilarious. It is perhaps slightly morbid that, in the end, bacon meets his demise at the tines of a fork. He certainly meets with a deserving end however. Everyone Loves Bacon is essentially a cautionary tale against narcissism, but in the funniest way possible. Age Range: 3-6 years old. The story portion of this picture book is very simplistic, so it would be easy to follow for preschoolers. Even elementary school children who think they are too old for picture books would likely appreciate the humorous aspect of it. The illustrations are a bold comic style that fits the personal dilemma which bacon is facing. Editor’s Note: It’s Children’s Book Week, May 2-8 2016! Celebrate by picking up your favorite children’s book at your local library. 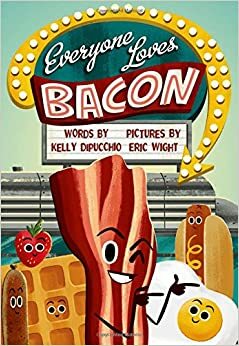 Categories: Awesome Reads, Books, Celebrations, Childrens | Tags: bacon, cautionary tale, Childrens Book Week, Eric Wight, Everyone Loves Bacon, food, funny, Kelly DiPucchio | Permalink. Comics have long been known as a form of entertainment for kids. The thrill of superhero rescues is exciting for any age, and the style of combining art with a storyline has extended to novel form in the last thirty years. Constantly expanding its reach, graphic novels are for children from kindergarten on up now. Rather than printed in periodical form as a comic is, a graphic novel is a book in comic strip form. If you have a reluctant reader on your hands, try a graphic novel with some great pictures to keep them interested! For an early reader, there is a wonderful series called “Toon into Reading” which is leveled for children in grades K through 3. 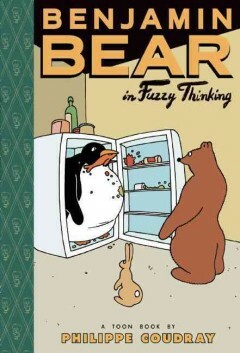 Benjamin Bear by Philippe Coudray is made up of page-long comic strips with surprising humor. 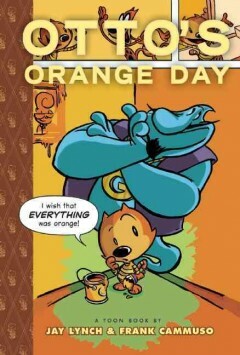 Otto’s Orange Day by Frank Cammuso and Jay Lynch follows a cat who wants everything to be orange, but discovers that maybe some variety is better. For middle readers, Jennifer L. Holm and Matthew Holm have written/illustrated multiple series together. 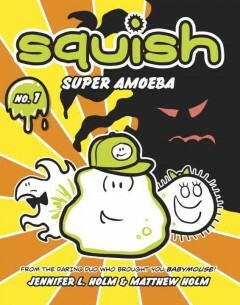 Squish is about a super amoeba whom the reader gets to follow about his days at school all while figuring out relationships with parents and friends. 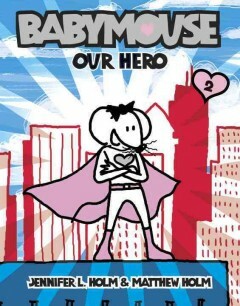 Babymouse is a sassy little mouse who is Queen of the World! Or at least she thinks she is. 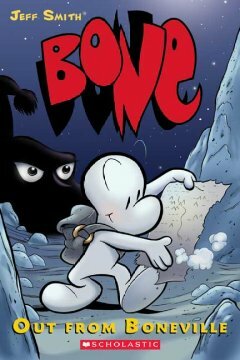 And for the older child, Bone by Jeff Smith and Amulet by Kazu Kibuishi are both filled with adventure. 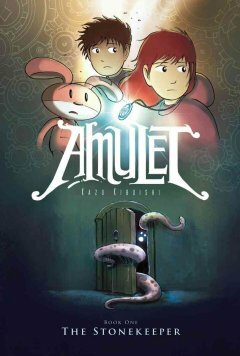 Bone will hold attention through the series with its interesting plot and Amulet has absolutely incredible illustrations. So come by the Children’s Room to pick out a graphic novel today! Categories: Books, Childrens, Graphic Novels | Tags: Childrens Book Week | Permalink.